International Team Consulting carries out sales projects in Germany for several companies from abroad. 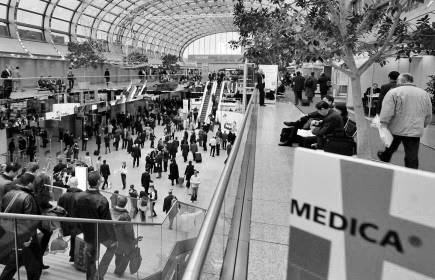 ITC will assist several companies during their visit to the Medica 2015 Fair. Target: Improve competitiveness and explore business opportunities. Advances in telematic and information systems for medicine. The Fair also organises forums (MÉDICA IT HEALTH FORUM) in which participants will receive first-hand information on the collection and distribution of data. Where leading specialists will present progress made in science and industry that open up new paths to explore. The Fair will hold conferences. For example, The MÉDICA EDUCATION CONFERENCE which will demonstrate the connection between medical science, practice and technology and which will open up valuable information on several functional areas. MÉDICA will be enhanced by its being held simultaneously with COMPAMED, which is the leading international fair for auxiliary industries and medical supplies where the visitor will be able to see the latest in raw materials, components, packaging, and services as supplied to health technology industries. International Team Consulting will ensure that your participation in fairs brings the maximum of benefit and turns out to be a huge success. As well as the paperwork involved in attending or exhibiting at a fair, our team of professionals will carry out pre-fair tasks such as the search for contacts and scheduling interviews and meetings with potential customers, development of sales techniques and the post-fair follow-up. © Copyright 2014 International team Consulting. All rights reserved.